You are invited to visit a wonderful nature`s nook that is worth discovering in any season of the year. Three rooms are designed for 2 persons, all the other rooms for 4 people. All rooms have toilet and shower. There are also seperate apartments for rent for up to 4 persons. These have no kitchen. The cozy rooms are diffusing a smell of wood logs evoking the childhood memories about time spent in the country farmstead. Catering may be entrusted to our care since our café we run is proud having a sign of European culinary heritage of Auktaitija region. Excursions are organized. Boats, skis and bicycles are for rent. 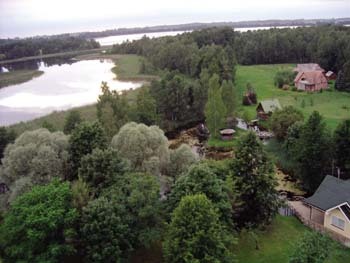 The farmstead is surrounded by lakes; In the East and South by Alauas (10 – 100 m) In the North by Giedrys ( 300 m), in the East by Lankos (100 m).Favourite place of fishermen, as the bay abounding in fish is near the farm-stead. This inlet is in the area of 1009 ha of Alausas lake.